If you know me, you know I love simple and cute. I consider it the perfect combination, especially in my own cookie world. Sometimes you want something sweet (and cute:)) without a lot of effort. 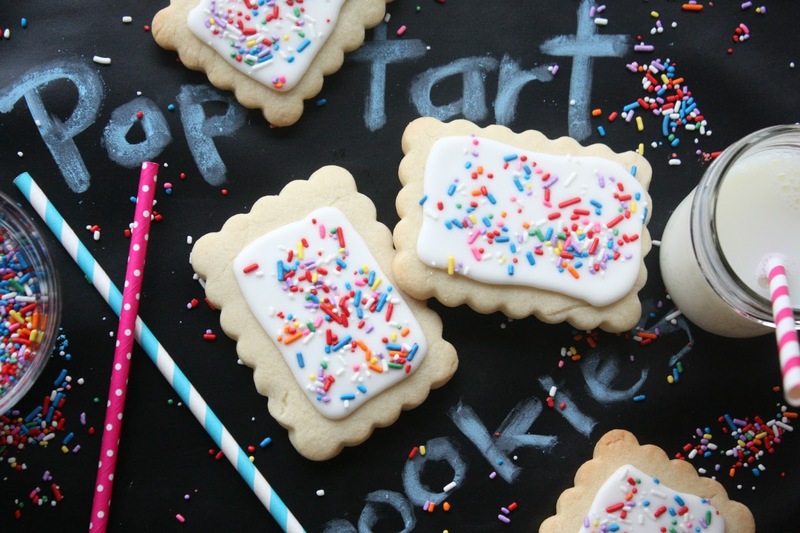 These pop tart cookies fit the bill! I spotted them first on Kim's blog, The Partiologist! If you haven't visited her site, you are really missing out! Kim is very talented, and her treats are always the picture of perfection! 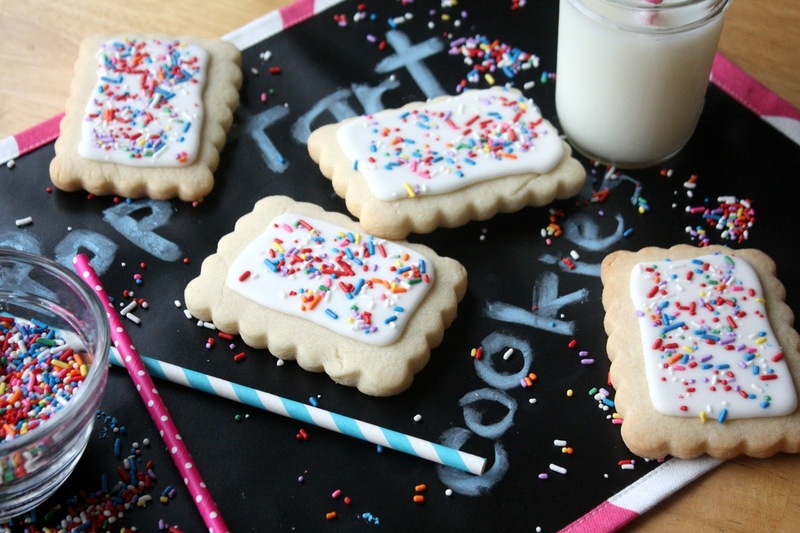 Of course you can make these pop tart cookies in chocolate and/or top them with tinted icing if you'd like, but I kept them super simple with the basic cookie dough and untinted icing. 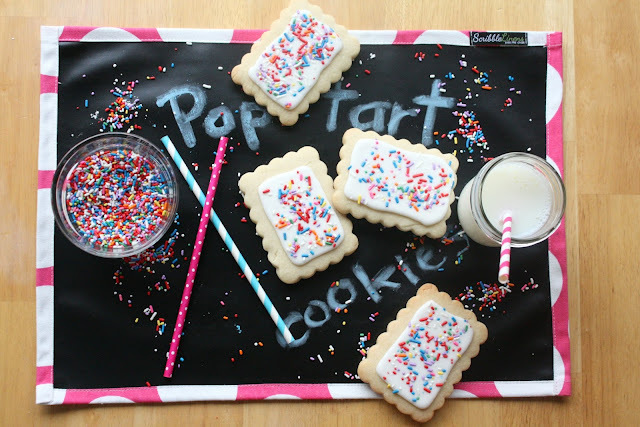 Unlike the original pop tarts, there's no filling involved, which makes these the cookie version:) Pop tarts are a classic childhood treat, so these are sure to please the child in each of us. The perfect backdrop for these cookies is this adorable placemat sent to me from Scribble Linens. The reverse side is adorable fabric, bright pink with big white polka dots. I love it! This side is chalk cloth and it wipes clean very easily. Visit the Scribble Linens site for other usage ideas and more great products (I was also given a table runner)! 4. Bake according to recipe directions. 6. Apply the royal icing following the shape of the cookie, but leaving an exposed (uniced) edge-see photo. 7. Sprinkle the royal icing with the jimmies. All done! Time to enjoy your delicious cookies! These are super cute, Sue. Oh my! These are just too cute for words! You really come up with the cutest ideas! These are SO CUTE. I love the sprinkles!! Sue you have such a great imagination! I LOVE these! I always wonder what you do with all your cookies? Are they for the munchkins? I think I would sample them too! Oh my goodness -- these are just about the cutest cookies I have ever seen. Real poptarts were always a bit too sweet for my taste (with the exception of the brown sugar-cinnamon variety -- yum!) -- but I'm sure I would love these cookies. I've been looking for a use for my small scalloped rectangle cookie cutter. Thanks for the inspiration! What a wonderful way to start my day...thanks for the shout out! Your little Munchins are so lucky to savor all your creations!! Love these! So cute. Love them! I would call this cookie a cheerful one! It is so easy to bake it and I`m sure that they are tasty. But the only thing I wonder, is it safe for kids because as I suppose it is quite solid and they can choke. Maria, These cookies are not overbaked so they are pretty soft and easy to eat. Cookies in general are not usually a choking problem. Oh how cute! They totally look like Pop Tarts! Great job! Wonderful cookies... they are too dang adorable! Sometimes simple is just best...like in your cookies shown here. Very, very cute. I love Kim's blog, here creativity never fails to blow me away and I'm hoping she writes a Party Idea book one day. Kim's party book would be awesome! Definitely going to taste better than the real thing, right? Always something new and creative! I love trying other blogger's recipes. That's why I am on Pinterest right?!!!! The cookies are really cute, and I love the place mat too! Once again you have a cute and colorful cookie ... much prettier and tastier than real Pop Tarts! You look very appealing to children!